If this formula is not unified correctly please contact us. No common natural material comes anywhere close to melting like Gerstley Borate (GB). It begins to melt between 1550F and 1600F and is a clear amber glass by 1750F and ultraclear and glossy by cone 06 (Ulexite melts better but it is not commonly in use in ceramics). It has thus been a staple among potters for many years. 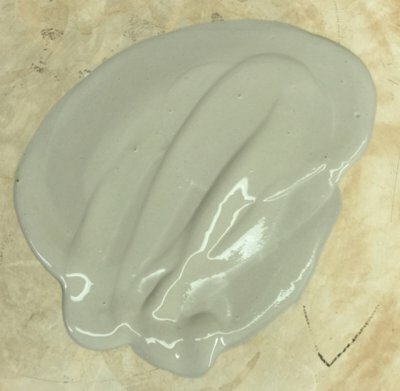 50% can be found in many cone 06-02 glazes, up to 30% in cone 6 glazes. Gerstley Borate is also very plastic and thus suspends and hardens glazes as they dry. In fact, few clays have the plasticity and the ability to retain water that GB has. A GB slurry can take many hours to dewater on a plaster batt, even in a very think layer. Thus it is common to find Gerstley Borate based recipes having no clay content. GB natural source of boron that was mined in southern California for many years. Mineralogically it is a combination of colemanite, ulexite and high plasticity clay (likely hectorite). The melting behavior of ulexite and colemanite is quite different, the unusual early melting behavior GB exhibits this, it suddenly implodes to a brown opaque melt (because of the earlier fluxing of ulexite) which later turns transparent (when the colemanite joins in). Since GB glazes melt well and are so easy to make, most people have overlooked issues surrounding its use. Glazes with high GB content that host potentially toxic metallic colorants or other materials are often assumed to be non-leachable because they melt well (where as, in fact, they may have an unbalanced chemistry). Gerstley Borate has almost no Al2O3, this is a problem because glazes need it and Al2O3 is normally sourced from clays, especially kaolin. But since GB is so plastic, adding more plastic materials to a glaze causes excessive drying shrinkage (producing cracks and ultimately crawling). One solution is to use calcined kaolin. Another option is to source Al2O3 from feldspar, however to get enough to create a stable glass oversupplies KNaO and causes crazing. 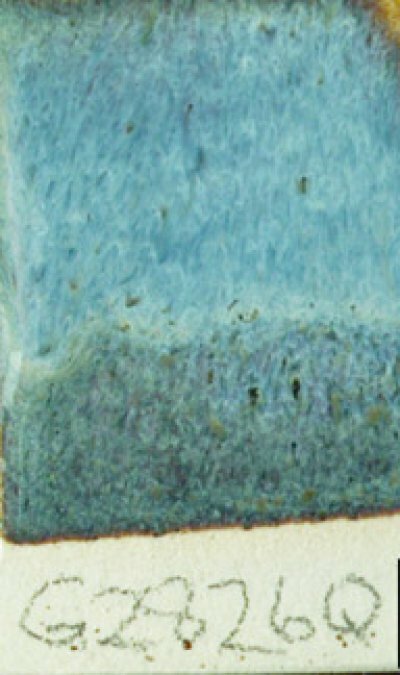 High GB glazes often have alot of micro-bubbles in the fired glass and micro-dimples on the fired glaze surface (most visible in transparents). 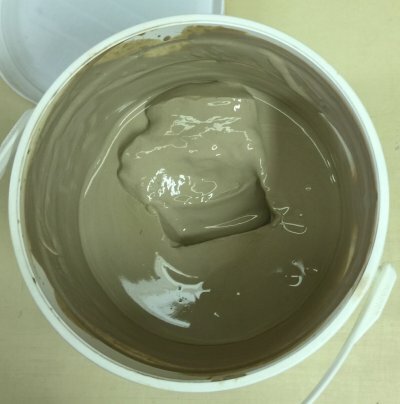 Slurries also tend to flocculate and gel causing problems with glaze application, drying and adhesion. Because this material melts so well, potters who use it have been willing to endure alot of these issues. One common low to middle fire transparent, for example, has 50% GB and adds 30% kaolin to that, producing a slurry the dries even more slowly, gels quite badly and shrinks considerably as it dries. The mine was closed in 2000 and remaining stocks were to be depleted in 2-3 years. There was alarm across the ceramic community in North America leading up to and after the closure (because Gerstley Borate formed the basis of so many glazes). However in June 2011, the supplier, Lagunaclay.com, announced that there was again a large supply still available. For the best information on substitutes visit gerstleyborate.com. There is a page on the site dedicated to understanding what Gerstley Borate was chemically, physically and mineralogically. There are a number of materials that have been developed as substitutes over the years, these are outlined at the website also. However the best approach is to finding an alternative is the use of ceramic chemistry on a glaze-by-glaze basis (to substitute other materials). In many cases, it is better to use frits to supply the CaO and B2O3, they are less volatile, more consistent and reliable and do not flocculate or gel the glaze as Gerstley Borate does. In cases where frits cannot deliver the needed chemistry, Ulexite can be employed. Prior to, and during the decade of uncertainty about the future of this material, the supplier did not provide updated chemistry information. It was during this time that many companies promoted substitutes. We rationalized it (as explained at http://gerstleyborate.com) as 24% CaO, 4% MgO, 0.5% K2O, 4% Na2O, 2% Al2O3, 25% B2O3, 14% SiO2, 0.5% Fe2O3 and 14% 26% LOI. In June 2011 we changed the chemistry provided here to the one provided by Laguna on their website (rounded to 1 decimal). This new chemistry has more B2O3 and less CaO (other oxide amounts are fairly similar). Originally popularized by James Chappell in the book The Potter's Complete Book of Clay and Glazes. It is loved and hated. Why? The high Gerstley Borate content makes it finicky. But the magic ingredient is not the GB, it is the rutile, Rutile makes the cobalt and iron dance. This recipe actually produces a number of different mechanisms of variegation. Color and opacity vary with thickness. 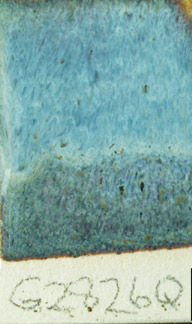 Small rivulets of more fluid glass flow around more viscous phases producing micro-areas of differing colors and opacities. Titanium crystals sparkle and calcium-borate creates opalescence. Bubbles of escaping gases (from GB) have created pooling. Small black speckles from unground or agglomerated particles of iron are also present. Surprise! This is actually Ravenscrag Floating blue. All the visuals, none of the headaches. Both of these glazes were made as 1000 gram batches and then mixed with the necessary amount of water to produce a slurry of the correct consistency. The one on the left is a fritted glaze with 20% kaolin, the one on the right is a Gerstley Borate based raw glaze (30% GB + feldspar, silica, ball clay). The GB glaze required much more water and gelled shortly after (it also tends to dry slowly and crack during drying on the ware). The fritted glaze has very good slurry and application properties. The green boxes show cone 6 Perkins Studio Clear (left) beside an adjustment to it that I am working on (right). I am logged in to my account at insight-live.com. In the recipe on the right, code-numbered G2926A, I am using the calculation tools it provides to substitute Frit 3134 for Gerstley Borate (while maintaining the oxide chemistry). A melt-flow GLFL test comparison of the two (bottom left) shows that the GB version has an amber coloration (from its iron) and that it flows a little more (it has already dripped off). 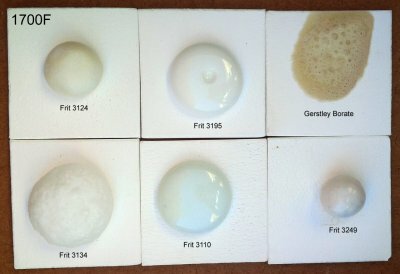 The flow test on the upper left shows G2926A flowing beside PGF1 transparent (a tableware glaze used in industry). Its extra flow indicates that it is too fluid, it can accept some silica. 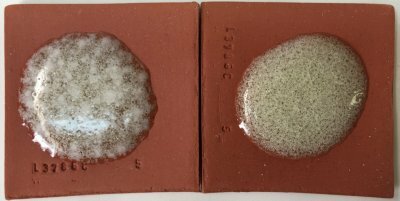 This is very good news because the more silica any glaze can accept the harder, more stable and lower expansion it will be. You might be surprised how much it took, yet still melts to a crystal clear. See the article to find out. 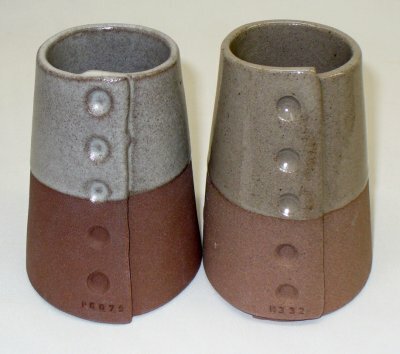 These glaze cones are fired at cone 6 and have the same recipe: 20 Frit 3134, 21 EP Kaolin, 27 calcium carbonate, 32 silica. The difference: The one on the left uses dolomite instead of calcium carbonate. Notice how the MgO from the dolomite completely mattes the surface whereas the CaO from the calcium carbonate produces a brilliant gloss. 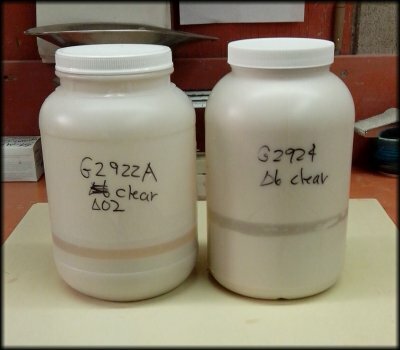 Left: Worthington Clear cone 04 glaze (A) uses Gerstley Borate to supply the B2O3 and CaO. Right: A substitute using Ulexite and 12% calcium carbonate (B). The degree of melting is the same but the gassing of the calcium carbonate has disrupted the flow of B. Gerstley Borate gasses also, but does so at a stage in the firing that does not disrupt this recipe. However, as a glaze, B does not gel and produces a clearer glass. A further adjustment to source CaO from non-gassing wollastonite would likely improve it. 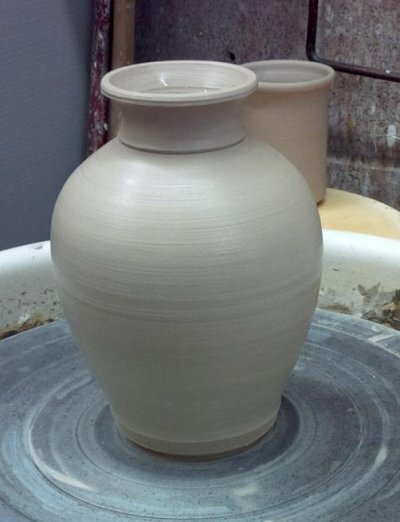 Can you actually throw a Gerstley Borate glaze? Yes! Worthington Clear is a popular low fire transparent glaze recipe. It has 55% Gerstley Borate plus 30% kaolin (Gerstley Borate melts at a very low temperature because it sources lots of boron). GB is also very plastic, like a clay. I have thrown a pot from this recipe! This explains why high Gerstley Borate glazes often dry so slowly and shrink and crack during drying. When recipes also contain a plastic clay the shirinkage is even worse. GB is also slightly soluble, over time it gels glaze slurries. Countless potters struggle with Gerstley Borate recipes. How could we fix this one? First, substitute all or part of the raw kaolin for calcined kaolin (using 10% less because it has zero LOI). Second: It is possible to calculate a recipe having the same chemistry but sourcing the magic melting oxide, boron, from a frit instead. Which one contains more SiO2? These cone 04 glazes both have 50% Gerstley Borate. The other 50% in the one on the left is PV Clay, a very low melting plastic feldspar. On the right, the other 50% is silica and kaolin, both very refractory materials. Yet the glaze on the right is melting far better. How is that possible? Likely because the silica and kaolin are supplying Al2O3 and SiO2, exactly the oxides that Gerstley Borate needs to form a good glass. Gerstley Borate (with Ferro frit 3124) from 1600-1750F. At 1550F (not shown) it suddenly shrinks to a small ball and then by 1600F it has expanded to double its size. By 1650 it is well melted, but still gassing and bubbling. LOI is not important? Think again! 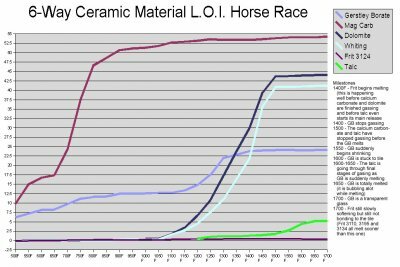 This chart compares the gassing behavior of 6 materials (5 of which are very common in ceramic glazes) as they are fired from 500-1700F. It is a reminder that some late gassers overlap early melters. The LOI (loss on ignition) of these materials can affect your glazes (e.g. bubbles, blisters, pinholes, crawling). Notice that talc is not finished until after 1650F (many glazes have already begin melting by then). Do you know the purpose of these common Ferro frits? I used a binder to form 10 gram GBMF test balls and fired them at cone 08 (1700F). Frits melt really well, they do not gas and they have chemistries we cannot get from raw materials (similar ones to these are sold by other manufacturers). These contain boron (B2O3), it is magic, a low expansion super-melter. 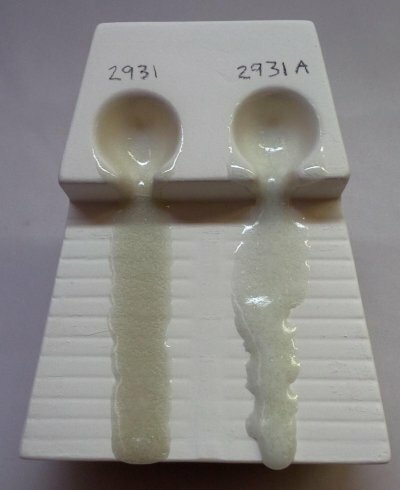 Frit 3124 (glossy) and 3195 (silky matte) are balanced-chemistry bases (just add 10-15% kaolin for a cone 04 glaze, or more silica+kaolin to go higher). Consider Frit 3110 a man-made low-Al2O3 super feldspar. Its high-sodium makes it high thermal expansion. It works in bodies and is great to incorporate into glazes that shiver. The high-MgO Frit 3249 (for the abrasives industry) has a very-low expansion, it is great for fixing crazing glazes. Frit 3134 is similar to 3124 but without Al2O3. Use it where the glaze does not need more Al2O3 (e.g. it already has enough clay). It is no accident that these are used by potters in North America, they complement each other well. The Gerstley Borate is a natural source of boron (with issues frits do not have). At 1550F Gerstley Borate suddenly shrinks! The melt fluidity ball tells us. These GBMF test balls were fired at 1550F and were the same size to start. The Gerstley Borate has suddenly shrunk dramatically in the last 40 degrees (and will melt down flat within the next 50). The talc is still refractory, the Ferro Frit 3124 slowly softens across a wide temperature range. The frit and Gerstley Borate are always fluxes, the talc is a flux under certain circumstances. 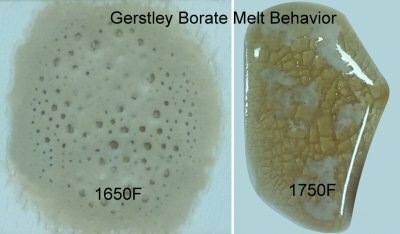 Why does Gerstley Borate melt in two stages? Because it is two minerals. The ulexite in Gerstley Borate melts first, producing an opaque fired glass having the unmelted (and still gassing) particles of colemanite suspended in it. By 1750F the colemanite is almost melted also. Boron-containing frits, by contrast, begin softening at a much lower temperature and gradually spread and melt gradually. Not surprisingly they produce a more stable glaze (albeit often less interesting visually). What material makes the tiny bubbles? The big bubbles? These are two 10 gram GBMF test balls of Worthington Clear glaze fired at cone 03 on terra cotta tiles (55 Gerstley Borate, 30 kaolin, 20 silica). On the left it contains raw kaolin, on the right calcined kaolin. The clouds of finer bubbles (on the left) are gone from the glaze on the right. That means the kaolin is generating them and the Gerstley Borate the larger bubbles. These are a bane of the terra cotta process. One secret of getting more transparent glazes is to fire to temperature and soak only long enough to even out the temperature, then drop 100F and soak there (I hold it half an hour). Compare fired glaze melt fluidity balls with their chemistry and lights come on! 10 grams GBMF test balls of these three glazes were fired to cone 6 on porcelain tiles. Notice the difference in the degree of melt? Why? You could just say glaze 2 has more frit and feldspar. But we can dig deeper. 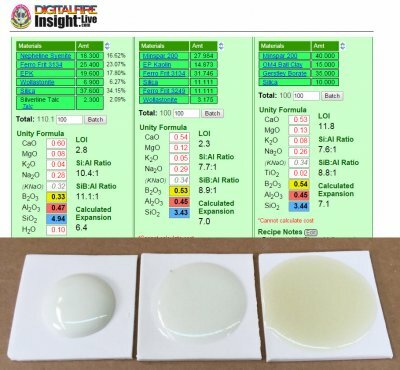 Compare the yellow and blue numbers: Glaze 2 and 3 have much more B2O3 (boron, the key flux for cone 6 glazes) and lower SiO2 (silica, it is refractory). That is a better explanation for the much greater melting. But notice that glaze 2 and 3 have the same chemistry, but 3 is melting more? Why? Because of the mineralogy of Gerstley Borate. It yields its boron earlier in the firing, getting the melting started sooner. Notice it also stains the glaze amber, it is not as pure as the frit. Notice the calculated thermal expansion: That greater melting came at a cost, the thermal expansion is alot higher so 2 and 3 glaze will be more likely to craze than G2926B (number 1). This glaze slurry contains 30% Gerstley Borate. I poured it onto a plaster table and it can take five or ten minutes to dewater enough to form it in test balls. A typical glaze would dewater twenty times faster! Gerstley Borate is like bentonite, it voraciously hangs on to the water it has. This is the reason that many GB glazes take a long time to dry on bisque ware. Generally slow drying also means cracking, that in turn can lead to crawling. 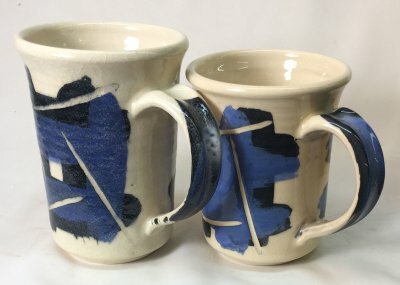 Floating Blue is a popular cone 6 glaze recipe used by the pottery community. Gerstley Borate is a material commonly used in recipes as a melter. The recipe produces a variegated surface but is difficult to replicate since its fragile mechanism makes it susceptible to variations in thickness, firing schedule, clay body and material supplies. 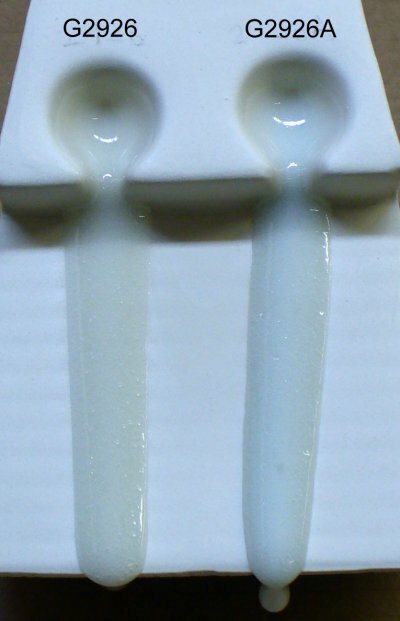 Melt fluidity test showing Perkins Studio clear recipe original (left) and a reformulated version that sources the boron from Ferro Frit 3134 instead of Gerstley Borate (right). The later is less amber in color (indicating less iron) and it melts to very close to the same degree. These are various different terra cotta clays fired to cone 04 with a recipe I developed that sources the same chemistry as the popular Worthington clear (50:30:20 GB:Kaolin:Silica) but from a different set of materials. They key change was that instead of getting the B2O3 from Gerstley Borate I sourced it first from Ulexite (G2931B) and then from a mix of frits (G2931K). All pieces were fired with a drop-and-hold firing schedule (like C03DRH). Fit was good on many terra cottas I tried (pieces even surviving boiling:icewater stressing). Where it did not fit I had thermal expansion adjustability because more than one frit was sourcing the boron. Frits are so much better for sourcing B2O3 than Gerstley Borate (the later is notorious for turning glaze slurries into jelly!). Why would a glaze turn into a jelly like this? This is one of the things Gerstley Borate does to your glazes. Stir this and you might have 2 seconds to dip something before it turns to jelly again (this was even deflocculated with Darvan and it was OK yesterday). It has a low specific gravity (a high water content) and will dries very slowly on my bisque ware. 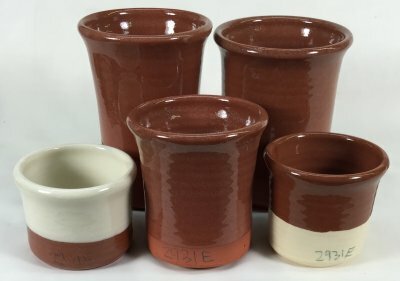 How can I make this glaze into a fast drying beautiful-to-use slurry? Replace the Gerstley Borate with something else. What? Gerstley Borate sources B2O3, I can supply it using frits or Ulexite (depending on the amount of GB that is in the recipe). I can do that in my account at insight-live.com. These pieces are the same body and fired at the same temperature. The original glaze was found on the internet, and is popular. Materials within it are "farting" as the glaze is melting (they have a high LOI and the calculated LOI of the glaze as a whole is 15%). Unless it is applied very thinly this is the fired result (at cone 03): tons of micro-bubbles. And it is crazing. 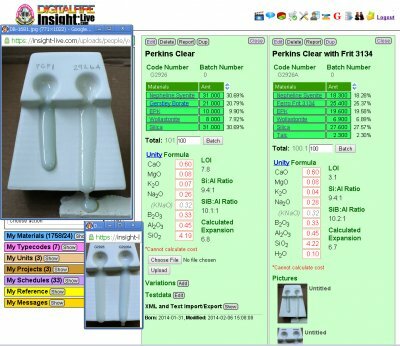 Using my account at insight-live.com I was able to source the B2O3 and MgO from a frit (actually two frits) and reduce the thermal expansion at the same time. As you can see, the product is a dazzling ultra clear (thick or thin) that fits perfect (it survives a 300F-to-ice-water IWCT test). (Videos - Unspecified) Help for Long-time Gerstley Borate Sufferers!